At the halfway point of the competition, the remaining bakers had a ‘tuiley’ good time with a range of stunning Showstoppers, although Rob’s Dalek failed to save him from extermination and Frances’ biscuit tower encountered a spot of structural failure. Fortunately Mel was on hand to hold things together – physically and emotionally! Follow us on Twitter @BritishBakeOff to take part in the next challenge to give a Bake Off episode a title in the style of the sitcom ‘Friends’. 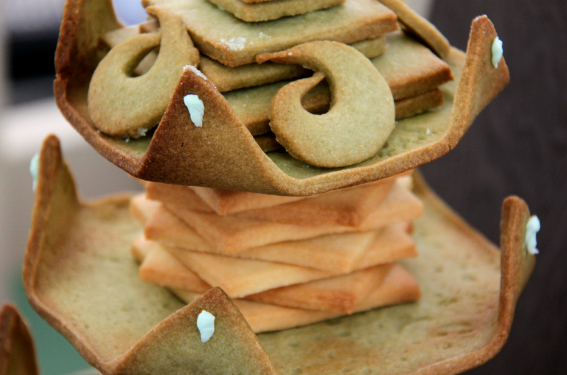 Howard – Japanese Tea Tower: a pagoda style tower of tea-flavoured biscuits.